THE BIGGEST LITTLE SHOW IN NEW YORK! The Annual Thumb Box Exhibit continues at the Salmagundi Club for the 108th year! This is a REALLY BIG little show :-) Both the Main Gallery and the Lower Gallery at the Club are filled with hundreds of small paintings no larger than 9x12 inches (image size). The show opened on Monday, November 21st and it will run until January 1st 2017. The public is invited to a reception on Thursday, December 8th from 6:00 to 9:00PM. I am happy to say that the first painting above, "Morning at Libby's Cove" has received a "Certificate of Merit"! I am really honored to have this painting singled out considering the number of really good paintings hanging on those walls! I am particularly pleased because these paintings were truly labors of love. The first two paintings (the Libby's Cove paintings) were painted from memory. Like many of you I have "go to places" in my mind that I can image during times of stress to remind me of better days. This cove in York Maine is one such place as is the beach in front of the beach house we owned for 20 years on the Outer Banks of NC. The cove was my summer playground as a child. We spent our summers in a bare bones, one room cabin (camp as Mainers say) atop a hill overlooking this cove for the first 15 years of my life. This is where I first learned to oil paint and I could sit on the porch and paint the cove right from the cabin. Later in life the same would be true on the Outer Banks. The house was much larger but the porch also afforded an unobstructed view of the ocean. My 15 year old dog, Lucky, was dying when I painted the upper two paintings. I would not leave him alone during the beautiful fall weather so instead of plein air painting outdoors I painted in the studio from the images in my head while he slept next to me. I worked quickly with the palette knife and let the love of place come through as best I could. I will always think of him when I see these paintings and only I will know how much love is in them. The 88th Grand National Exhibit! I think a trip to NYC might be in order as my painting "Jesse,Waiting" has been selected for the 88th Grand National Exhibit sponsored by the American Artists Professional League! 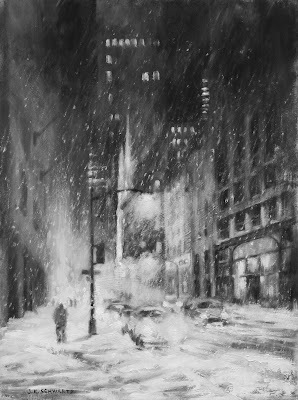 The exhibit will open this Sunday, November 6th at the Salmagundi Club at 47 5th Avenue, NYC and will be on view until November 18th. A reception will be held on Sunday, November 13th from 12:00 until 5:00. This has become my favorite national exhibit as it includes paintings, drawings and sculpture by artists from around the country. The work is always high quality and I love that drawings are included as they so rarely are. The drawings selected in prior years have been very good but this year there are some really extraordinary pieces to see! I don't envy the awards committee as selecting winners in all categories will be a challenge. This is my 6th year participating and I am thankful the jurors have once again chosen one of my paintings, particularly this one. This is a painting of my eldest granddaughter painted a couple of years ago. 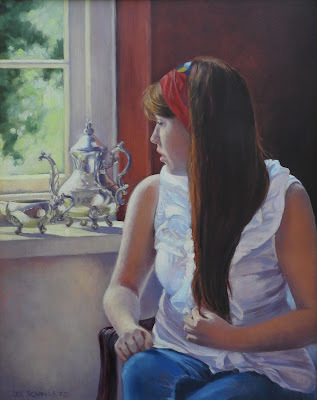 I rarely do figurative work as it is difficult to find sitters but Jesse was a willing model and a good one! 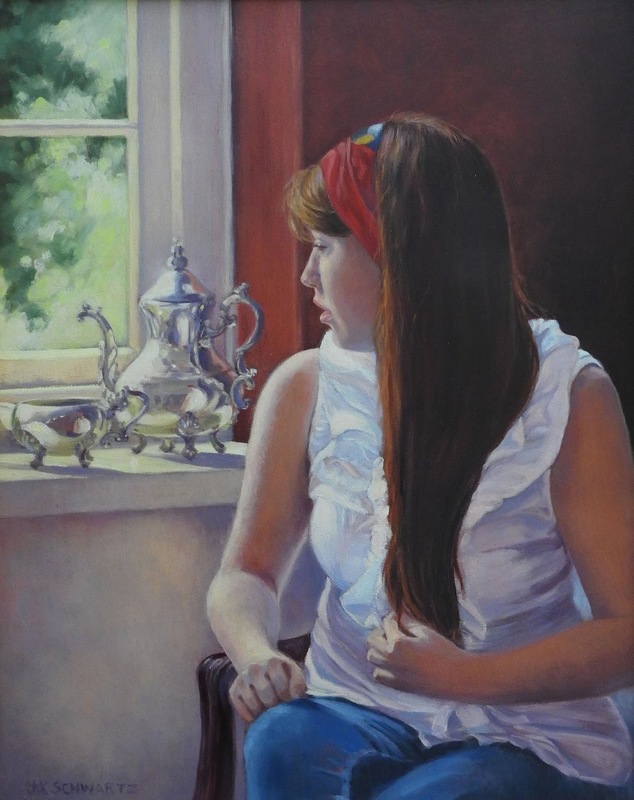 I painted her in a wistful mood with my mother's silver sitting on the window sill. Actually the sitting was shared with three other artist friends of mine and we all contributed props and clothing. We used the main salon at a local private school as it provided a variety of views and antiques as well as a terrace. We all did photo shoots of Jesse and created CD's of our photos which we shared with one another. I had the advantage of being able to have Jesse available to me here at home when I needed live reference for the painting :-) I hope you like this one! This summer was a challenge. Family events prevented me from spending the amount of time in the studio that I would have liked. I made up for that by doing small, plein air studies from my home and some of them were posted to this site. I had started this painting in June with the intention of completing it quickly as it was flowing along nicely. I wanted to work wet into wet when creating the sky and the wet pavement. I was able to get the sky in at once and a good start on the rest when work ground to a halt. By the time I got back to it there was no choice but to work wet on dry and this time it might have worked in my favor. Painting wet roads for me means keeping it loose. To get back into it I just started applying paint with a palette knife and then dragging it around with a credit card, rolling through it with an interesting inch wide wooden roller I found at the hardware store and leaving marks or pulling it around with a squeegee. I ran a brush through the paint to create the marks made by the cars or the flow of water. It was a lot of fun! The most fun, however, was adding the lights! That is why most of my cityscapes are evening or night scenes. I LOVE, the reflections and refractions. It is interesting when I study the roads during and after a rain that the reflections don't always show up where you think they will. There are so many fascinating dimensions! I hope you enjoy viewing this one as much as I enjoyed painting it. 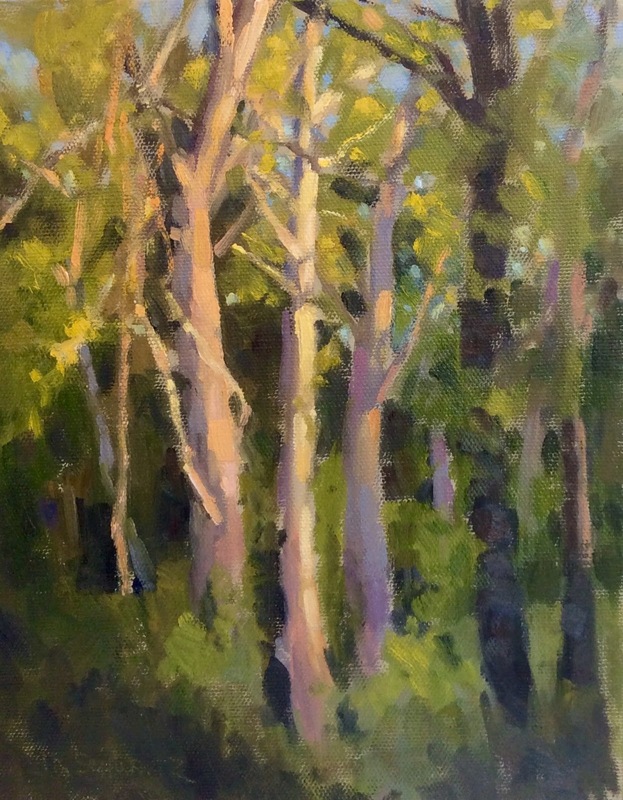 Chasing the light is a common phrase heard from plein air painters. It is a challenge! All summer I have been admiring the evening sunlight as it hits those trees at the edge of the woods behind my house. I kept promising myself I would paint it but the intense heat wave we have been experiencing this month kept me from doing so. Finally, the night before last we had a cool, breezy break in the weather and I didn't hesitate. I started painting around 6:15 and finished at 7:30. I took the bottom photo before adding some warm tones to the dark tree trunk on the far right. I wanted to be sure to get the photo while the light was still strong on the trees. These little studies are great lessons in seeing and getting down the important stuff. The small format is perfect for this. I have been keeping my pochade box set up right inside the door so I can get out and paint at a moments notice. There is quite a bit to see in my own little world just off the deck. 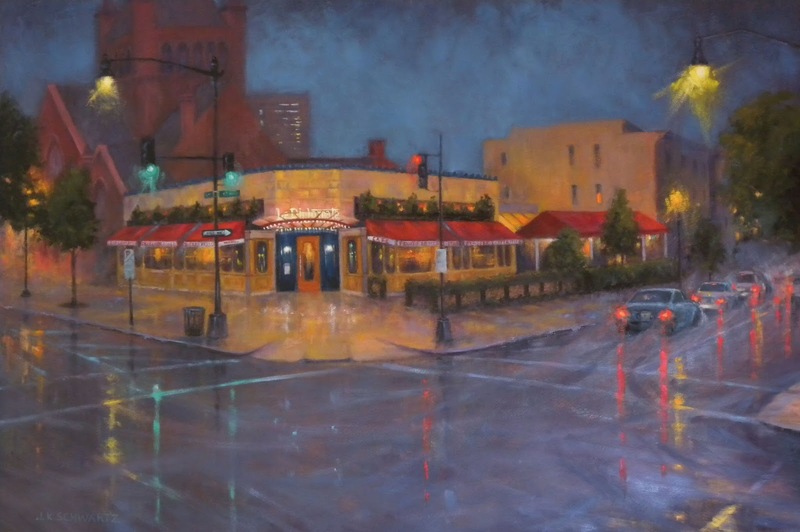 Last week I completed this nocturne of a very popular brasserie at the corner of 14th street and Q Street in Washington DC, Le Diplomate. I passed by it one rainy night and found the colors and warmth of the place very inviting and the many reflections interesting and beautiful. By day the place makes a strong statement. The deep red brick of the Romanesque church provides a powerful backdrop to the restored, one time corner laundry. Primary colors dominate the scene and contribute to the cheer. For my night scene I used a primary and secondary color palette. I chose several blues, reds and yellows. The blues dominated (lately they always seem to with me) ultramarine blue, cerulean blue, cobalt and indigo. 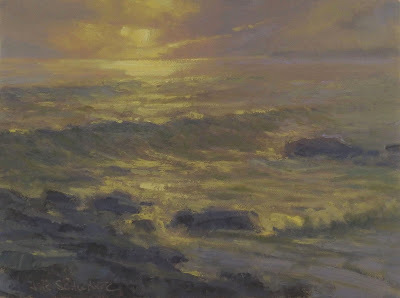 My reds were cadmium and alizarin and my yellows were ochre, cadmium yellow light and naples yellow light. While it appears in the photo that I used black for things such as the lamp posts, it was actually a mix of indigo, alizarin and ochre. I used white very sparingly and it appears in some of the headlight reflections and on the street signs as well as the lights beside the door. A friend commented that he found this an upbeat, cheerful nocturne which is opposite to the mood that most nocturnes set. I appreciated the comment because that is precisely what drew me to the scene. 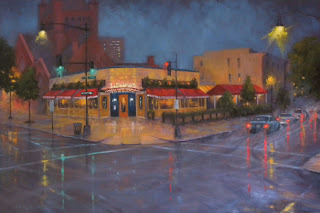 I wanted to be inside enjoying the food, wine and life while watching the rain outside. It may be a street scene but it speaks to the life within. I finished this painting two days ago and it was a joy to be working large again! I plan on continuing with works 24x30 and larger for quite a while. Small works are fun and a great way to work out new ideas but I painted LOTS of them this fall and winter and it is time for a change. I am sure you recognize this view as the same from two posts back, hence the post title. 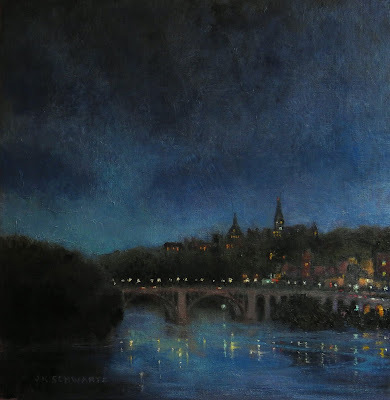 Standing on the north end of the terrace of the Kennedy Center and looking west provides this wonderful view of Georgetown. I have had fun painting it as a rainy nocturne, a deep blue nocturne and now at the moment between dusk and the descent of night. I love this particular moment that lasts just for that long. The color fades really fast so writing it down and committing it to memory is best because I am never able to capture exactly what I want with my camera. I did a small color study painted to scale in my sketchbook and that is what I worked from. A daytime photo gave me all the information I needed about the placement of the buildings and the rest was from my mental picture. I prefer the freedom of working that way. ON THE EASEL: A painting titled "Le Diplomate" 24x36. I just started it today and the subject is the restaurant of that name on the corner of 14th Street and Q Street. It is a nocturne after a rain. Once again, I am working from a sketch and a color study both to scale in my sketchbook. I hope I will be posting the finished painting soon. 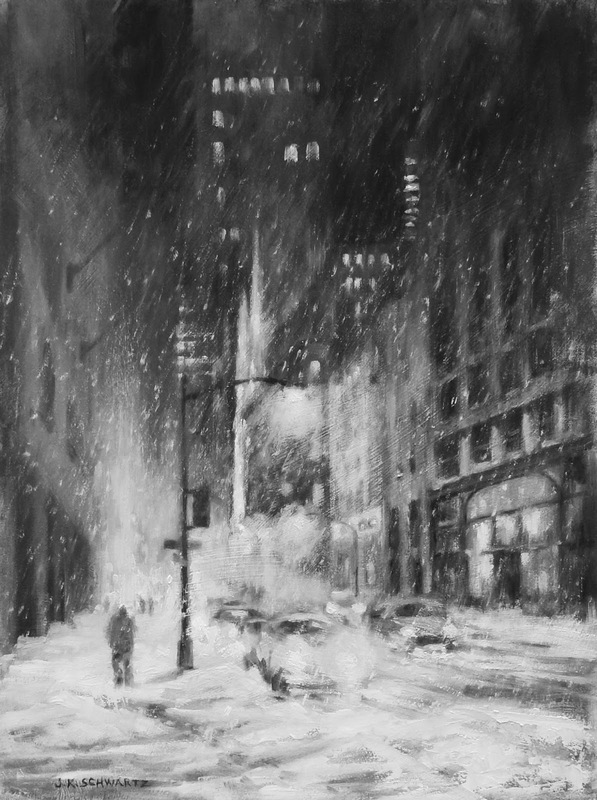 Every year since 1878 the Black and White Exhibit has taken place at the Salmagundi Club on 5th Avenue in NYC. In the 19th century newspapers depended on the skills of illustrators and many of those illustrators were members of the Salmagundi Club. The exhibit was established to showcase their work. Over the years, centuries actually, the show evolved to include all media but with the rule that all be either black and white or sepia and white ONLY. No color accents allowed. I very much enjoy participating in this exhibit and the unifying element of the extremely limited palette always makes for a strong display. 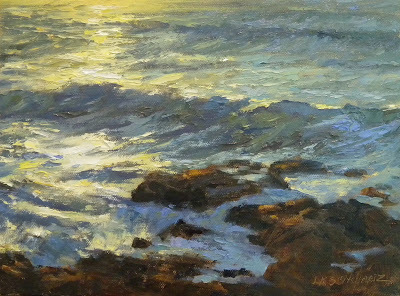 This year the show is particularly exciting for me because my painting, shown above, has received the Salmagundi Club Award! Am I happy and honored? You bet! 2016 HISTORIC BLACK AND WHITE EXHIBIT : Monday, January 18th thru Thursday, February 4th 2016. 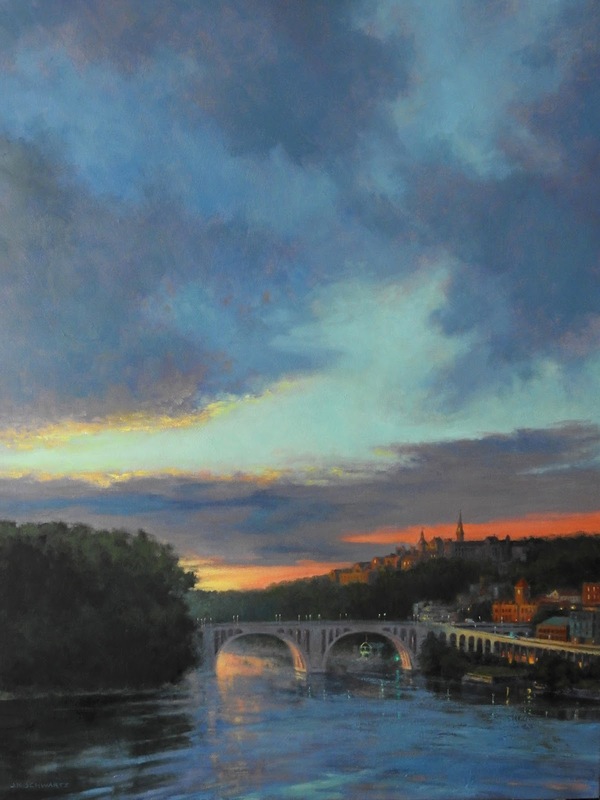 Reception Thursday, January 21st 6-8 PM (open to the public). This exhibit is free of charge. THE INTERNATIONAL ARC SALON EXHIBIT : Same dates as above. This is a traveling exhibit of paintings by the finalists in the 2014/2015 ARC competition showcasing the work of some of the finest contemporary realist painters. The show was most recently in Madrid. There is a $15 charge to see this exhibit. Can you tell that blue is my favorite color? So many beautiful shades to choose from and I am finding those making up the night sky particularly enticing these days. This is the same view as "Rainy Night on the Potomac" from my last post. This one is larger but still a small painting and I wanted to explore a new range of color. I had planned these as studies for a larger piece but for now I think I will stop and perhaps paint a larger one later. I feel I have pretty much said it all in this one. Both of these were painted from memory of the view seen from a corner of the terrace at the Kennedy Center. I had planned to go back with my camera and take photos but perhaps it is best that I didn't. I would have had to zoom in for this shot and I am sure there would be many details that literal me would have gotten hung up on while painting. 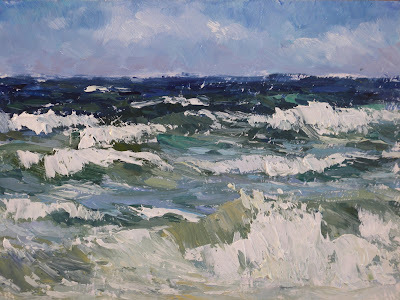 I painted this one with a palette knife and brushes and it is already more detailed than the little one I did with the credit card, palette knife and large bristle brush. Today I blocked in another cityscape on a 24x30 linen panel. 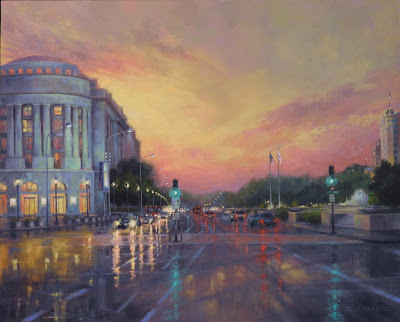 This too will be a nocturne but it will be a street scene, Pennsylvania Avenue again and I suspect I will continue singing the blues!